Unity and expressing the Agape love of God are the two most repeated commands in the New Testament. The Bible says that the message of our faith can be reduced to three things: Faith, Hope, and Love. Of these three, the greatest is love – agape. Agape is the love of God, given to us for the purpose of uniting us with God and bonding the church together in unity. If this is the most important thing to God, shouldn’t it be the most important thing in the church? The bond of love is broken, not because agape love is insufficient, but because we have erected walls of separation within the Body of Christ (the Church). While modern day church leaders are drawing more lines of separation and claiming to be defending God, the Lord has declared that anything that divides the brethren is sin. God needs no defender. The word needs no defender. God has declared that His word will accomplish His purpose, and nothing can prevent His hand. If this is true, then our defense of God is a distraction from being a part of His purpose. 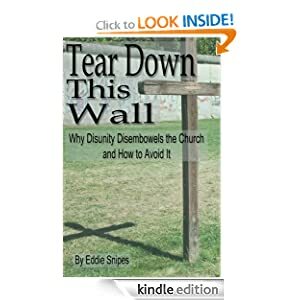 This book looks at God’s command of unity in the church, how we accomplish this, and how we are to look at divisions, denominationalism, and other barriers from the Bible’s perspective. Is there any justification for divisions in the church? How do we unite without compromising the truth? The Bible provides the answers.